We all know that applying for OT jobs is intimidating. 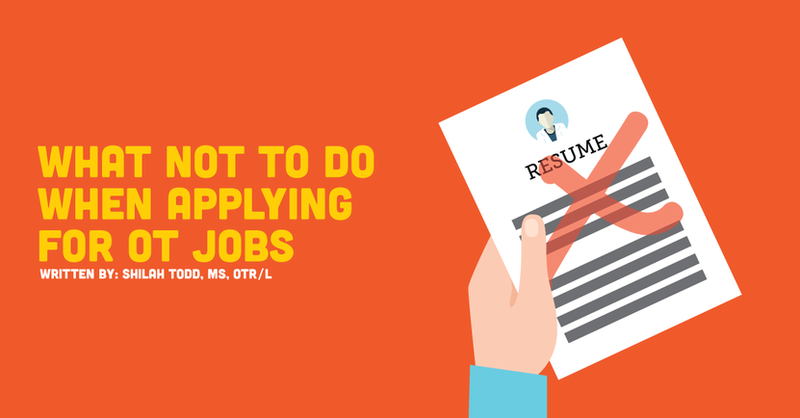 It is especially stressful applying for OT jobs since this may be your first "real" job as a new grad occupational therapist. From building a great resume to writing the perfect cover letter, it’s all a bit daunting. But now looking back at my experience, I can tell you that there are a few things I wish I had NOT done. And they may not be what you’d expect. When I began applying for OT jobs and exploring open positions, I was set on working in only one or two different settings. These were the “best fit” for me, (or at least I thought) and I completely ignored other postings. What I came to realize by the end of my second Fieldwork placement was that I could then see myself in different settings because of what I had learned about myself over those 12 weeks. For example, during my first Fieldwork placement, I had sworn off acute care because I wanted to work in a setting where I “actually got to spend time with patients”. However, by the end of my second Fieldwork placement, I had learned that I craved a fast-paced environment and was heavily considering working in acute care. Where do I work now? Acute care. And I love it! Now, this may sound like a far-fetched idea, and for some people it is. I realize there are extenuating circumstances like having kids in school, a spouse with a job in one location, aging parents, and numerous other things that wouldn’t allow you to just pick up and move cross country. However, too often as new grads we say, “I want to work in _____ doing ______”, and we don’t want to vary from that. The reality is that yes, there are always OT jobs, and the market is very good. But, if you are in an area saturated with OTs, it can be tough to land a job when experience outweighs your fresh 4.0 GPA. For me, when I began to look outside that 50-mile radius, I finally found what I was looking for in a job. I found the setting I wanted, the benefits I needed, and the organization that I craved to be a part of. So, if you are single or are in a life situation where you can move, consider it! You may just find your dream job. This seems like a no-brainer, but hear me out. As a new grad, it is tempting to just apply to everything, even if you know you don’t want the job. But here’s the thing, if you interview to all of those jobs, it’s a waste of everyone’s time. Yes, it may give you interview experience, (which isn't a bad thing). I turned down three jobs before I accepted my current position. Had I truly asked myself, “Do you really want this job?” before applying to those jobs, I probably would have only had to turn down one instead of three. That’s a lot less stress and time lost on everyone involved. Also, if you are applying for OT jobs you would say no to, you may be taking an interview spot for someone who truly wants it. The waiting room is an analogy for the entire process. The time between applying for a job and getting called for an interview could be as long as 6-8 weeks. From that time until the position is filled could be another 6-8 weeks. At the end of the day, all you can do is cover letter for this position and then breathe. They will contact you if and when they want an interview. That seems like a buzzkill, but here’s the good news. At least you can now prepare for that kind of time lapse. Being the type A control freak and planner that I am, I found this one of the most stressful things about that time in my life. Waiting. However, I want to leave you with one of the best pieces of advice I received during that time. This is the last time in your life (until retirement) that you won’t be working full time. Take the opportunity to do those little (or big) things you’ve always wanted to do. Take that trip. Read for pleasure. Sleep in. Get back to a regular workout schedule (I mean, we know those things go out the window during grad school). Renew your CPR certification. Learn sign language. Now I realize you may not have the luxury of living with your parents or not working during this transition phase. So what can you do that is flexible while you begin the process of your new career? So you’ve submitted your resume and cover letter, you’ve got the call, and it’s the day of your interview! What should you definitely NOT do? Dress for the occasion! You don't want to be the person who shows up in blue jeans or a short dress. On the same note, be mindful of your body language as well as the way you talk about previous employers. You don’t want to present yourself as too informal or as a “Negative Nancy”. You get one first impression. Make it count. To better prepare yourself, AOTA has put together a list of interview questions. The person interviewing you wants to know that you’re committed to patient care, that you are willing to work hard, and that you want to be apart of their organization. Asking about things like salary too early on can make you look like your priorities are not where they should be. Furthermore, salary is usually determined by things like experience and is negotiated in human resources, not by your direct superior. To compare salaries across settings, experience levels, and geographic locations check out the 2015 Salary and Workforce Survey. When applying for OT jobs, a manager never wants to hear,“Well I would rather work in outpatient, but acute care is fine with me”. They want to hear what you can offer to the team. How you’re excited to learn in this setting? Why should they choose you above anyone else? In conclusion, keep an open mind in this whole process. But, also know what you absolutely wouldn’t do and don't waste anyone’s time. Lastly, realize that this all takes a long time, so why not enjoy the wait? Now you know what you should avoid, so you’re prepared for the big day, and totally ready to rock that interview! Let us know what other tips you have or things to avoid in the comments.